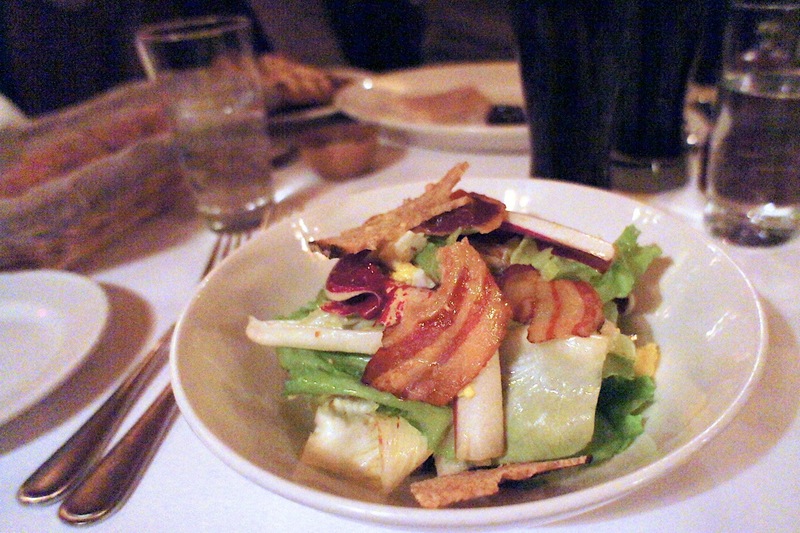 Nestled in the West Village is an old but admittedly hip bar and restaurant. 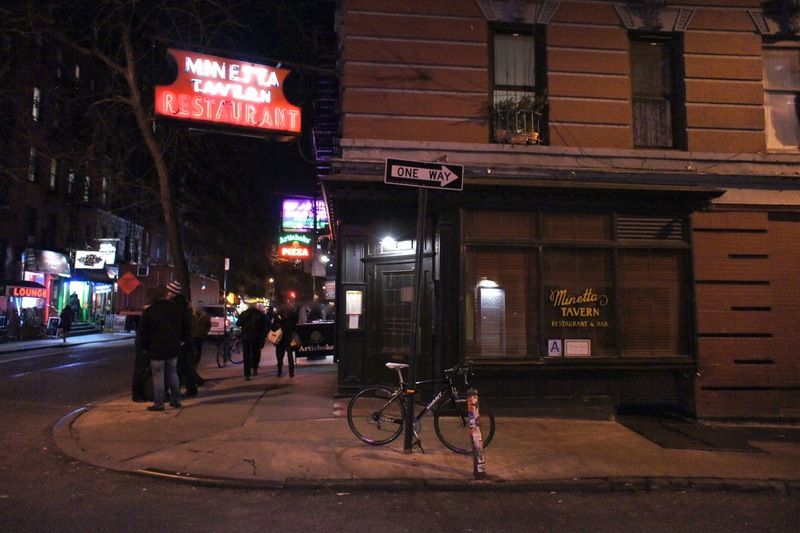 Curiously, Minetta Tavern has one Michelin star but given that Peter Luger had one too, it didn't really surprise us. Stepping through the door and heavy curtains, we were greeted in near pitch dark by a wall of noise, and the narrow interior was packed with guests at the long bar and diners at the small tables along the side. It looked pretty much like an old-school tavern/bistro, which accounts for part of its charm. It was notable that this was an establishment with very attractive staff. From the gorgeous Sca-Jo look-alike at the reception to the male waiters who could be or probably are aspiring young actors, the restaurant had a very young and trendy vibe despite the very old and traditional interior. The tables were very tightly spaced together and we were practically eating elbow to elbow with the next table, but it was very casual and from the boisterous laughters and chatter around, it was clear that people were having a very good time. Despite eying some very interesting items on its menu, especially its steak (which was served at the next table and looked delicious), we had just come from lunch at Peter Luger just a few hours before and was realistic about how much we could really eat that night. 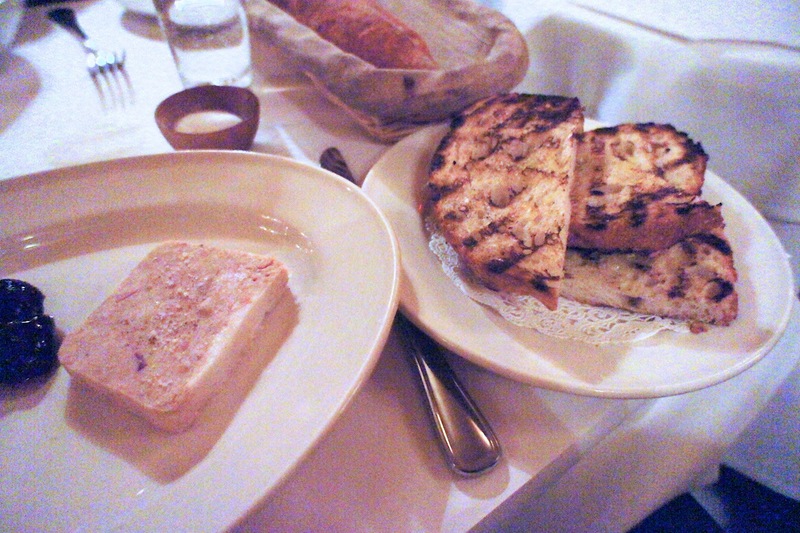 So we settled for a mesclun salad with warm goat cheese and a duck liver terrine for our starters, both of which were very good (especially the nicely toasted bread which accompanied the foie gras). 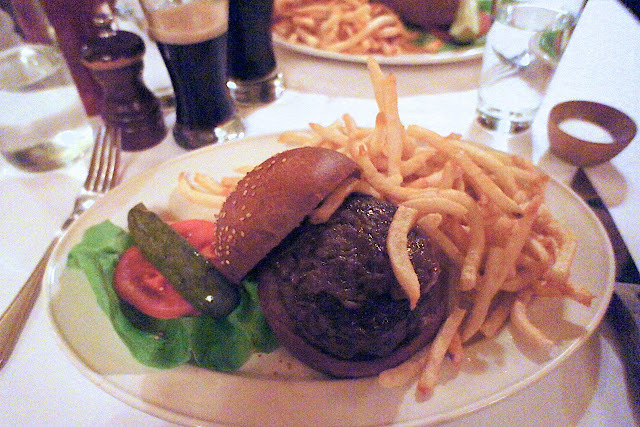 For the mains, we each had a different burger, I tried the Black Label burger, which was a selection of prime dry-aged beef cuts with caramelized onions and pommes frites. This was the more expensive burger choice as it used 'gourmet' cuts of the beef, and hence the taste was richer and fatter. It was a really good burger. 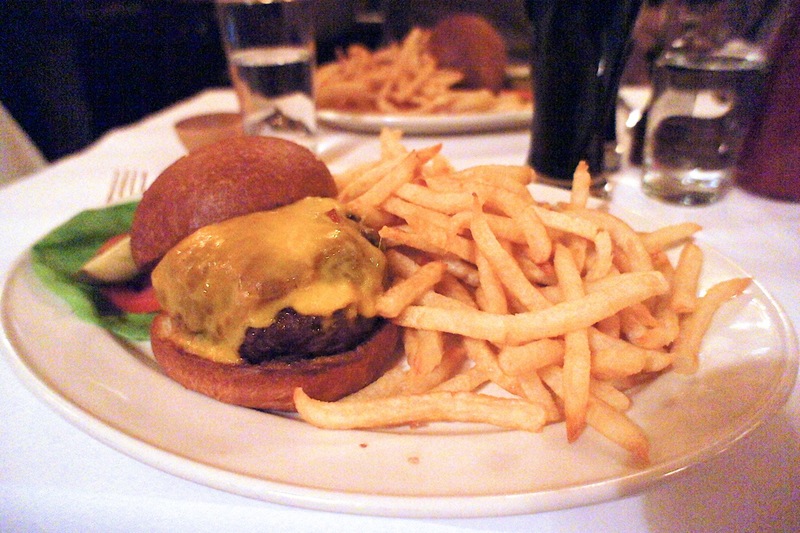 My wife had the Minetta Burger with cheddar and caramelized onions, which was less flavourful than the Black Label Burger but was nonetheless juicy and tender. Also a very good burger. In conclusion, despite the price difference, each of them was good in its own right, but I'd go for the Minetta Burger next time (as it was a proper burger whereas the Black Label was too fancy for my liking). It was a quick and 'light' meal and we skipped dessert having already gorged ourselves that afternoon on cupcakes from Magnolia Bakery along Bleecker Street. 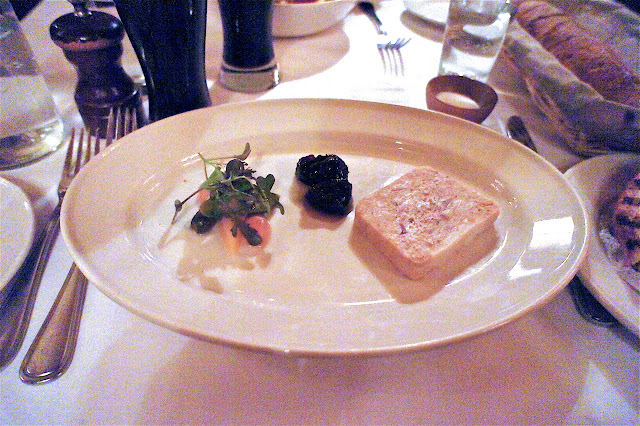 Final Thoughts: Every bit a tavern in term of its ambience and buzz, but with superb service and great gastropub food. 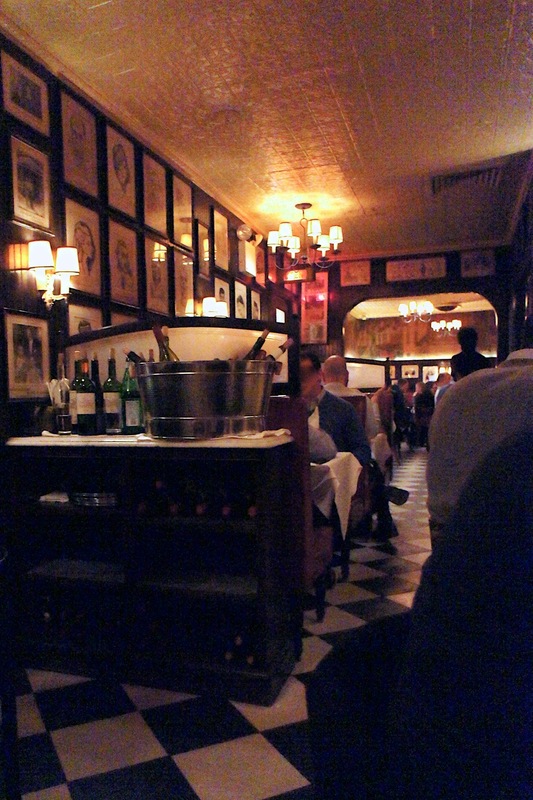 It's a fun and casual place but be prepared to rub shoulders with people in the next table and eat off small tables.